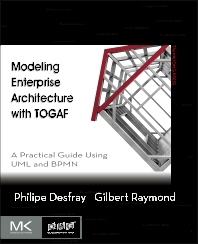 Modeling Enterprise Architecture with TOGAF explains everything you need to know to effectively model enterprise architecture with The Open Group Architecture Framework (TOGAF), the leading EA standard. This solution-focused reference presents key techniques and illustrative examples to help you model enterprise architecture. This book describes the TOGAF standard and its structure, from the architecture transformation method to governance, and presents enterprise architecture modeling practices with plenty of examples of TOGAF deliverables in the context of a case study. Although widespread and growing quickly, enterprise architecture is delicate to manage across all its dimensions. Focusing on the architecture transformation method, TOGAF provides a wide framework, which covers the repository, governance, and a set of recognized best practices. The examples featured in this book were realized using the open source Modelio tool, which includes extensions for TOGAF. Enterprise architects, business analysts, IT managers. Philippe Desfray is the Co-founder of and Vice President of R&D at Softeam. Internationally renowned expert and author of several books on modeling, Philippe is a contributing member of the OMG, where he participates in the elaboration of a number of standards, notably UML and BPMN. He has been involved in model driven development research, standardization, and tooling for nearly two decades. Gilbert Raymond is a Senior Consultant and head of Softeam’s Information System and Methods division. Gilbert is an expert in Information Systems and BPM, and is TOGAF 9-certified.